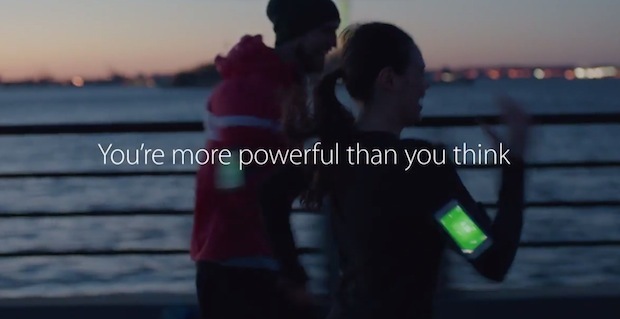 Apple has started running a new iPhone 5S commercial, titled “Strength”, which focuses on using the phone as a fitness aid. A video for the advertisement is embedded below for easy viewing. The TV advertisement follows people using the iPhone to track fitness goals, participate in physical activity, and serve as a form of digital motivation. A variety of fitness apps for iOS are shown in the commercial, including Nike+ Running, Zepp Golf, Wahoo Fitness, Sprint Timer, miCoach, and HealthMate. Most of the apps shown will function fine without any additional hardware by utilizing the built-in features in the iPhone, like the onboard GPS to track location and distances, and the accelerometer, to measure movements. The commercial is soundtracked to a song from the 1960’s, called Chicken Fat, or the “The Youth Fitness Song”, by Robert Preston, which was apparently distributed in an effort to get children to exercise. Timing for the commercial is somewhat interesting in that it’s running months prior to the release of iOS 8, which will include the native Health app that can function as a data hub for a variety of fitness and health statistics.